Mercedes-Benz Stadium has been universally lauded as a technological marvel since it opened for business in August 2017 as the home of the NFL’s Atlanta Falcons and MLS’ Atlanta United—along with a must-stop location for many top-selling musicians and myriad other events. These days, much of the team that helped this venue become the model for future sports and entertainment complexes—all while earning LEED Platinum certification for its environmentally friendly approach—is working on doing the same, or topping it, at the future home of the Los Angeles Chargers and Rams, complete with a halo-style video board that flies high above the playing field. That doesn’t mean, though, that the work that went into Mercedes-Benz Stadium was easy or without any sort of complication. In fact, one of the main features of the building—a retractable dome—nearly wiped out years of work for everyone involved before a single event was held there. The roof wouldn’t close properly during a typical Southern summer deluge and that led to inches, and in some cases feet of water, along the base of the building, all of which came dangerously close to wiping out a lot of that technology that was so meticulously planned and placed where owner Arthur Blank had approved in an effort to bring his fans the most immersive experience possible. All in all, though, the tech titans who helped Blank’s high-tech visions become a reality and the envy of the sports and entertainment landscape are pleased with the end result, even if they know they’ll never truly stop tweaking it. 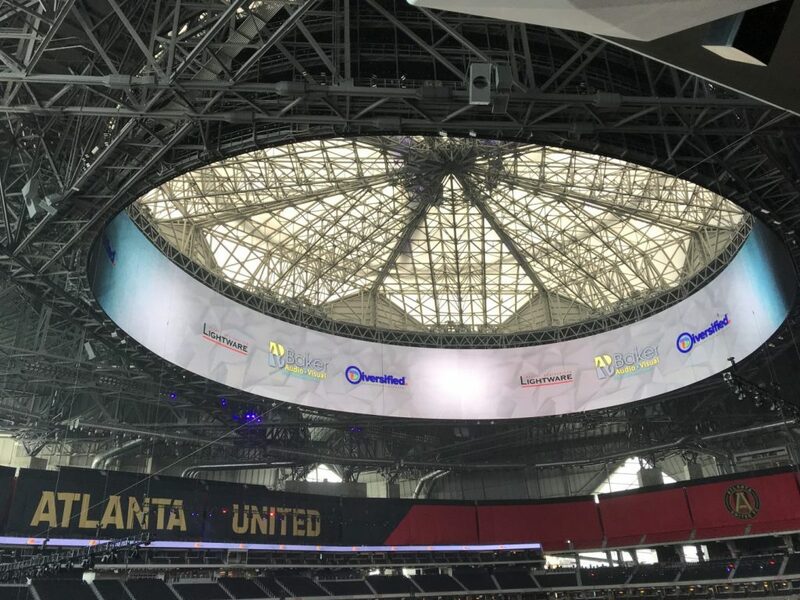 They talked about the planning, the execution and the future of Mercedes-Benz Stadium during an AVIXA Experience event at the stadium last week. There’s enough fiberoptic cable in the building to go from Atlanta to LA and back, for one thing and the stadium uses solar panels and water conservation as just a couple of ways of remaining focused on the world outside. It was the first stadium to implement an all-digital ticketing system and recently went cashless for all concessions. “We started looking at where venues needed to go,” says Danny Branch, CIO of AMB Sports & Entertainment, noting the planning for the stadium started in 2010. “We’re competing with people watching games on their 70-inch TVs on their couches. “A big part was making sure the infrastructure was future-flexible. By the time a lot of these stadiums open, they’re already way behind in terms of the demand their fans have on the systems they’ve installed,” he says. Branch describes the experience at Mercedes-Benz Stadium as “a digital immersion” of content. “We’re really focused on that experience from end to end,” he says. IBM originally wasn’t going to bid on the Mercedes-Benz project when the concept first was in the works in 2013-2014, says Dean Brantly, executive IT specialist and senior construction manager at IBM, but that changed later in the process. “We came back with a proposal that was so far out in the future that they decided to do it,” he says. IBM built a lab a few miles from the stadium’s future home where they mocked up and tested almost every component before installing it in the building. “That resulted in the Falcons being able to pick the best of the best,” says Brantly. It also meant about 99 percent of the 15,000 devices in and around the building worked properly the first time, he says. That includes 4,800 miles of fiberoptic cable, 15,600 ethernet points, 4,200 speakers, 98 miles of audio cable, 1,800 WiFi ports, 420 door security access control points and 7 terabytes of RAM. IBM also developed apps for the Falcons, United and the stadium itself along with a Siri-style program called “Ask Arthur” that helps fans plan their gameday from home to the stadium. 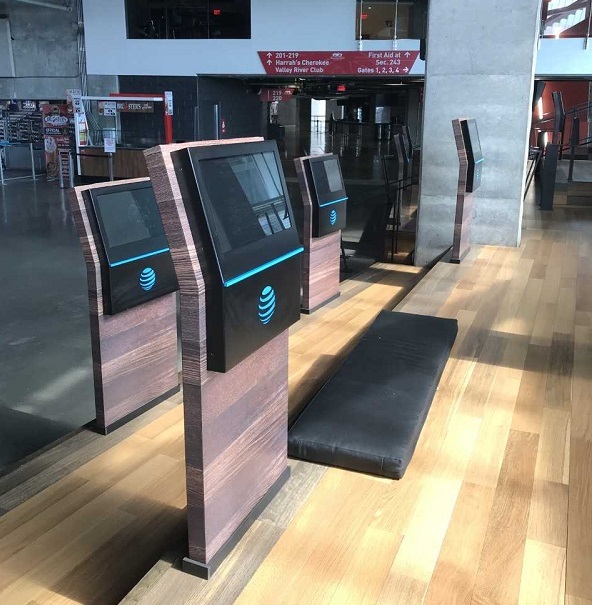 With 10 to 15 events every week at Mercedes-Benz Stadium, ownership wanted to make sure the tech inside of it was robust and built to last and that it was working with partners who wouldn’t take off for the next job as soon as the installation was done. 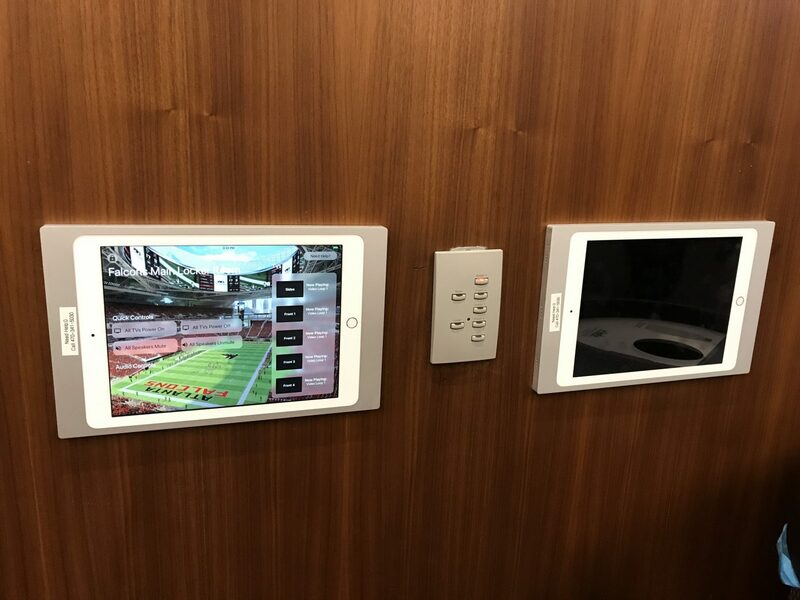 In addition to tech in and around the field area and the seating bowl and luxury suites, the stadium features about 60 huddle rooms, four large meeting rooms, a corporate boardroom, says Doug Stancil, director of special projects at Baker Audio Visual. It’s all outfitted with fiberoptic cable, he says. The implementation of Barco ClickShare throughout the building made some of the necessary collaboration more possible, says Brian Emerson, regional sales manager at Barco. “We were happy to be able to fill a need,” he says. Some of the equipment, including the IP video system, represented literally the first products in new lines for certain manufacturers, says Tom Sullivan, managing engineer at Diversified, so they were both excited to be the guinea pig but nervous with the stakes so high in a project so well-publicized. “You hear people talk about being cutting-edge or even bleeding-edge, but everything we did, they hadn’t even pounded the steel to make the razor blade yet,” he says. Diversified installed two production switchers—one for the massive halo-shaped video board that got much of the buzz before Mercedes-Benz Stadium opened, and another for the 2,500 displays around the stadium. “We always try to build a system with as much flexibility as possible,” says Sullivan. Mercedes-Benz Stadium has about 30 sponsor activation areas throughout the building, says Curtis Walker, technology director at Dimensional Innovations. Those areas represent unique ways for fans to interact in unique ways to create one-of-a-kind memories. “We wanted these brands to have an experience inside the stadium,” he says. “The way we all looked at this project was: if you build the fan experience, they will come,” says Walker. Ben Dolinky, video engineer at AMB Sports & Entertainment, agrees that it’s a different world. “It’s a shared experience of expectations for us and the fans,” he says. “People are expecting to be able to see and hear the game if they’re in line or not inside the seating bowl. We really try to listen to what they’re wanting us to do and respond to that. “It’s about how it’s all connected. No matter where you go, you’re actively connected to what’s going on on the field. We didn’t have a palette to work with at the time, but we have a staff that’s always trying to innovate and do new things,” says Dolinky. The United continue to set attendance records and the stadium has already hosted Super Bowl LIII, MLS Cup and an SEC Championship football game with the 2020 Final Four on the horizon. Dolinky knows that means even more pressure to create experiences fans have never seen. “The idea is to get people to come here and get more of the environment,” he says.